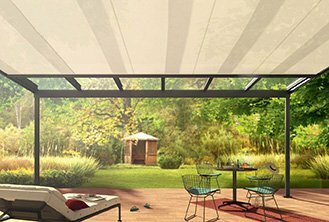 Weinor’s Livona Open style Awning System is the ultimate solution when technology and minimalistic design are called for. Its unique design allows the Awning to ‘Float’ in the air, creating an attractive and intelligent system that compliments your outdoor space. Weinor’s unique LED lighting system can also be added, giving you even longer functionality to suit your alfresco outdoor lifestyle. The Mini-Max option allows for maximum projection of 4m on widths as narrow as 2m, perfect for narrow courtyards! The Positioning of the Livona Light Strip and Side Light Rings elegantly spreads the lighting, providing a warm finish to compliment your al fresco lifestyle. The Livona series has an optional Top Plate, for that added protection for your awning, even in uncovered outdoor areas. If you place a lot of value on your privacy and also want shade from the low-lying sun, the Weinor Livona/LED Valance Plus is exactly what you are looking for. Small, compact, variable opening awning. Suitable for under balcony or protruding roof. Elegant design and brand new technology. Cassita is a gem amongst cassette awnings.